South Korean President Moon Jae-in and his wife Kim Jung-sook were received by President Ram Nath Kovind and Prime Minister Narendra Modi today at Rashtrapati Bhavan. NEW DELHI: The visiting South Korean President Moon Jae-in was given ceremonial reception at the Rashtrapati Bhavan here on Tuesday. 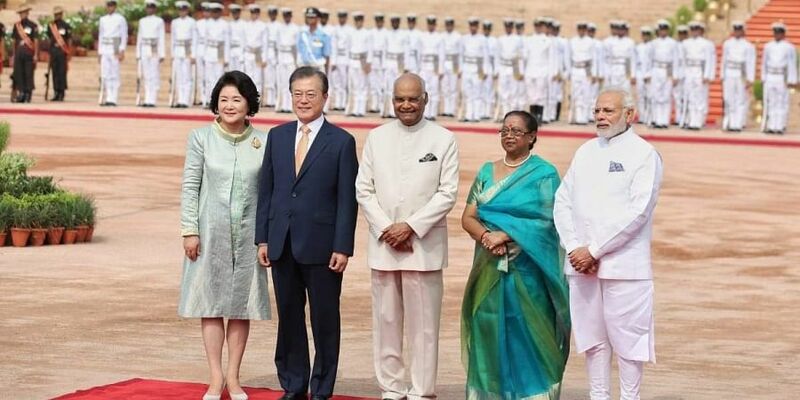 On his arrival at the Rashtrapati Bhavan, the foreign dignitary and his wife Kim Jung-sook were received by President Ram Nath Kovind and Prime Minister Narendra Modi. President Moon, accompanied by wife, arrived in the national capital on Sunday. The visiting dignitaries paid a visit to the Swaminarayan Akshardham Temple on Sunday evening. On the second day of his visit on Monday, while External Affairs Minister Sushma Swaraj called on the visiting President of Republic of Korea, in the evening President Moon and Prime Minister Narendra Modi inaugurated a new mobile manufacturing unit of Samsung at Noida in Uttar Pradesh. On the third day of his four-day visit to India, South Korean President will meet Prime Minister Modi and hold delegation level talks. A number of agreements are also expected to be signed between two sides. Vice-President M Venkaiah Naidu will also call on the visiting dignitary. The South Korean President would also visit Singapore from July 11 and these visits are largely seen as a push by his government for 'new southern policy'. This signals Republic of Korea's new approach to the countries in Asia, primarily focussing on Association of Southeast Asian Nations (ASEAN) and India. This year also marks the 45th anniversary of diplomatic ties between Korea and India and according to a Presidential spokesman in Korea, India has become an important partner for Korea economically and also for its efforts for peace and prosperity of the Korean Peninsula and the international community.